Selected papers: Reactive power and system operation - incipient risk of generator constraints and voltage collapse, J Goossens. Expert systems in energy management systems, B F Wollenberg. Sensitivity and partial re-factorization techniques for simulating outages of transmission lines, M S Sachdev et al. Robust load frequency control, E Tanaka & J Hasegawa. Fast initial estimation of power system eigenvalues, Y Xue et al. A flexible method detecting network clusters for emergency control, T Sannes. Optimal power flow experience in an energy management system, L J Jarrial et al. A new approach to mid and long-term power system analysis, Jae Chul Kim et al. A new coherence approach of generators for investigation of slow and system wide oscillations in large power systems, B E Eliasson & S O R Lindahl. A hierarchical expert system for failure diagnosis in power plants, P Lautala & M Valisuo. Power system modelling and simulation for integrated system expansion planning, O J Botnen et al. The Pacific Gas and Electric Company energy management system overview - unique features, D L Becker et al. Application of fuzzy logic control scheme for stability enhancement of a power system, T Hiyama & C M Lim. Derivation of correct relaying signals during intersystem faults for the protection of double-circuit lines, J Nilges. 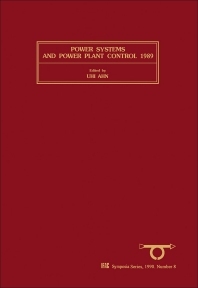 Security based economic operation of electric power system, Kwang Y Lee et al. Optimal PWM methods for active power filters, In-Gyu Park & Jong-Keun Park. Short-term feeder load forecasting: an expert system using fuzzy logic, G Lambert Torees et al. Network restoration expert system, G Krost & D Rumpel. Author index. Keyword index. For control, electrical and electronic engineers, computer scientists, power plant operators and nuclear engineers.